A3 Sized- can be seen by kids when I demo. Hallelujah!! Cute and colourful: I ♥ the Russian Doll and the birds! They have all the patterns that I want to use. Yippeee!!! I know that they are also going to be an extra special support to children who struggle with pencil skills and directionality. If you have a kid in your class with fine-motor control difficulties then these will be indispensable. I just wish that I had them last year for one of my kiddos. It would have made a huge difference. I found myself photocopying sheets to A3 and laminating them to create my own home-made version of these. They were just black and white, though, and not so appealing. 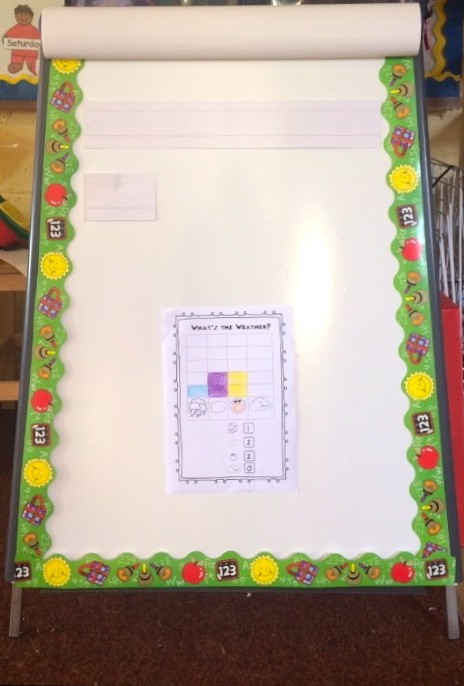 I am looking forward to clipping my Write-On posters to my mini flip chart and giving hand-on demonstrations and practice. My kids will have no problem seeing or reaching the posters. If you are looking for whiteboard markers then these are my absolute favourites!!! They have a round tip like a marker and are nice and slim for little hands. They also rub away cleanly and easily. I have re-purchased them again for my class this year. Click here for a link. Don’t forget to check out my post on developing a good pencil grip. Click here to visit. How many candy canes/hearts/stars/baubles are on the Christmas tree? If there were as many gifts as there are hearts who many gifts would be under the tree? How many children can have a candy cane if each child can only get one? What season would it be? How do you know? What else can you find on the top of a Christmas tree? Are there more baubles or hearts on the tree? Which bauble is the biggest? Who can find a colour pattern on the Christmas Tree? 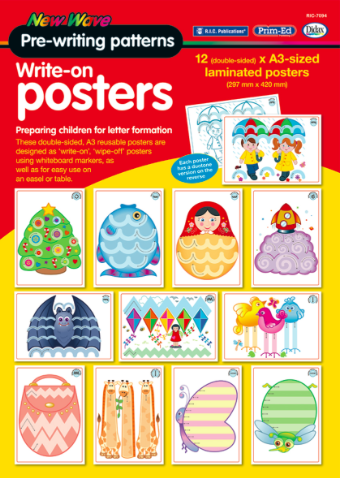 I think that these Prim-Ed New Wave Pre-Writing Patterns Write On Posters are going to be a great addition to my pre-writing resources. At just under 20Euro they are not a bad price at all. Check back the week after next for some photos of the posters in my classroom.